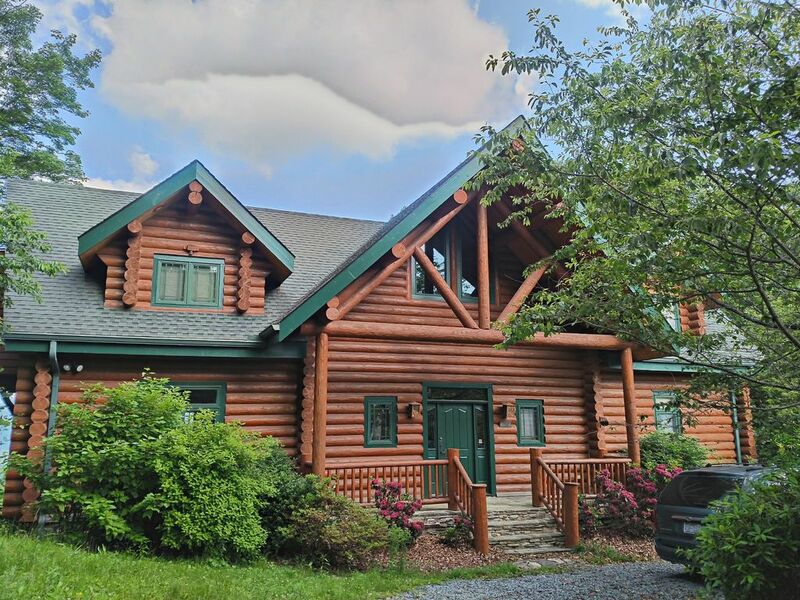 Spectacular, 13 year old luxury log cabin with fabulous view of Grandfather Mountain and the John's River Gorge. This house is constructed with 10 inch round logs from Montana for that western lodge look. It boasts a huge great room with 25' vaulted ceiling, beautiful stacked stone fireplace, lots of windows, huge deck to enjoy the view, top of the line kitchen, hickory floors, and inviting mountain decor throughout. At 3000 feet, the air is nice and crisp, but air conditioning is available if you need it. This house has three bedrooms and three full baths. Two of the bedrooms have fabulous views and private baths. One of these bedrooms, on the main level, has a queen bed. The bedroom upstairs has a queen bed and twin bed and has a beautiful bath with whirlpool tub. The second bedroom, on the main level, has a queen bed and hall bath. There is a queen sleeper/sofa located in the living room. There is a basement and additional bedroom upstairs but they are not available for rental. No pictures are shown of the areas unavailable and everything you see in pictures will be open for you. The dining room is spacious and opens onto a covered porch. The kitchen is very large and is fully equipped with double ovens, built-in microwave, downdraft gas range, garbage disposal, dishwasher, and refrigerator with ice-maker. There is a large breakfast bar in the kitchen so there is plenty of room for everyone to eat. The house is fully equipped with dinnerware, pots, pans, utensils, linens and has a washer/dryer. We are located on 4 acres backing up to the Pisgah National Forest, so hiking opportunities abound. No smoking is allowed in the home and sorry, no pets are allowed either. Downtown Blowing Rock is less than four miles away. Our house is 1 mile down a well-maintained gravel road. Four wheel drive is seldom needed. The decks offer many opportunities to enjoy the view. The back of the great room is all glass and opens onto a huge deck where a gas grill is located, as well as much seating. All of the baths are tile with upgraded fixtures. Hickory floors are throughout most of the house. There is much exposed wood with extra large posts in the entry hall, stone foyer, large stone front porch, and tongue and groove ceilings. Blowing Rock is a quaint village with an abundance of excellent restaurants, antique shops, and festivals in the park. The Blue Ridge Parkway is only 3 1/2 miles away and offers scenic drives, great hikes, mountain biking, and horseback riding opportunities. Skiing is available within a couple of miles at Appalachian Ski Mountain and the town has tennis courts. Seasonally, Tweetsie Railroad and Mystery Hill are open for children's' entertainment. Tweetsie is an amusement park with rides, a petting zoo, and old steam engine train. Grandfather Mountain is about 1/2 hour drive away and has the Mile High Swinging Bridge, and zoo. Appalachian State University is located about 12 miles away in Boone, N. C. Golf courses are available minutes away. Come experience the peace and quiet offered in this great setting. Listen to the birds, watch for wildlife, enjoy the reds and oranges of the spectacular Blue Ridge fall leaves, hike, or just relax in this newer luxury home. If you must bring some work with you, wireless wi-fi is usually available. Due to the possibility of high winds in the area, sometimes the wireless is out. If that is the case, dial up is available. IMPORTANT NOTE - There have been some phishing scams associated with internet vacation rental sites where an e-mail pretending to be from the owner has arrived requesting payment via a bank transfer. Do NOT wire money. I accept Paypal and checks only. Any communication from me will come from email address. If you wish to speak with me to verify your rental, my cell number is 704-534-1429. My husband and I designed and supervised the construction of our home. It was a rewarding, challenging, lengthy process, spanning almost 3 years from design to completion. We feel the end product was definitely worth the considerable effort and hope you enjoy and care for our home as much as we do. We recently spent a long weekend at this cabin. The location was convenient, the views were spectacular and the rental itself was clean, updated and comfortable. We enjoyed the spacious and well equipped kitchen, the magnificent windows and sitting by the fire with friends. The owner was very accommodating, and made herself available for questions. Except for the rainy weather, it was a great experience. I was looking for a respite from an already long and stressful year. This was the exact place I needed to be. The house is beautiful with spectacular views and in a very quiet and serene location. The interior of the home is large yet has a cozy feel of a log cabin. It felt as if we were far away from any city. Fortunately, Blowing Rock was just 2 miles away. With so many good restaurants, dinners out were convenient. I will definitely schedule another vacation here. We had a lovely stay! You house was perfect. Thank you! Beautiful cabin with lovely view! Very clear directions about the house and suggestions for restaurants and activities in the surrounding area. Thank you! Comfortable home with a nice kitchen!